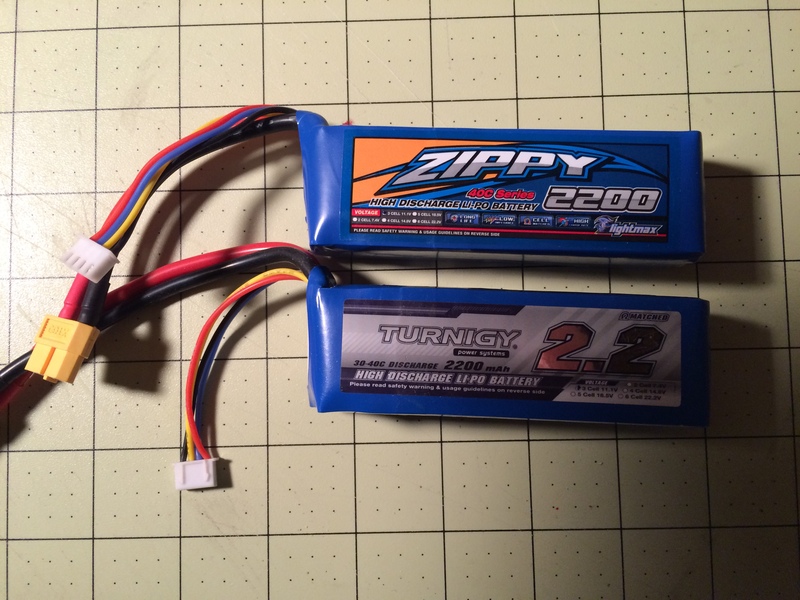 I have two 3s 2200mAh lipos that have ended their life early. One has a cell that is puffed and appears non existent, and the other has a cell that discharged itself to 0v without use. The other two cells in each battery appear to be fine and stable. I was wondering if it would be a good idea to take the good cells and make a 4s 2200mAh pack. One issue is that one's a Turnigy 30-40c and the other is a Zippy 40C. Is this a difficult/dangerous task or should I try for 2 2s 2200mAh packs instead, or just toss them? They've been bad for probably over 8 months so I know their stable in their condition. Thanks! No problem with either option but you will need a balance plug for a 4s. You can probably get away with the 3s balance plugs on a 2s depending on the charger. There are quite a few uses for Lipo cells. I would just take them apart, properly throw away the bad cells, and storage charge the good cells. I took apart a bad 2200 3s and made it into a 2200 2s for my Hitec Aurora 9. The stock nimh was awful compared to the lipo. Be very careful when taking them apart to not short anything. I cringed when I thought about taking apart a LiPo. But as long as you do it in a safe environment (I.e. not on your kitchen table) I don't see why you couldn't. But you would have to be very diligent not to short anything or cut a cell like ExperimentalRC stated. Seems like a lot of work for a $10 battery though in my opinion. I'd take it to your local electronics shop (Best Buy for instance) and recycle it. It is no big deal to reduce or increase cell count in a LIPO as long as good safety is observed. Make absolutely sure that you have a quick disposal route available in case something "dumb" is done and the cell's start to melt down. Note the Smoke from a LIPO meltdown is EXTREMELY toxic so if accident happens stay upwind of the battery. "Toxic gases (HF, PF6 ) will be formed if cells or battery are involved in a fire. Cells or battery may flame or leak potentially hazardous organic vapors if exposed to excessive heat, fire over-voltage conditions. Damaged or opened cells or batteries may result in rapid heat and the release of flammable vapors."